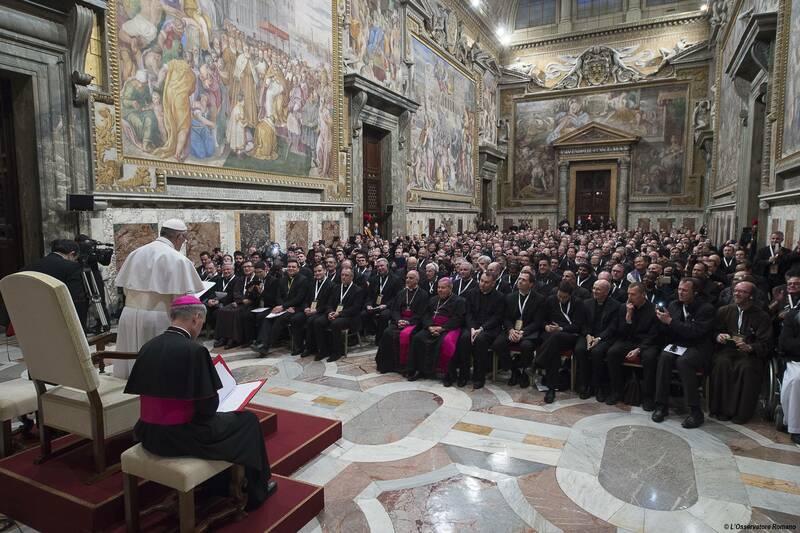 On the vigil of Ash Wednesday, Pope Francis received in audience priests who have been selected as Missionaries of Mercy for this jubilee. During the Mass of Ash Wednesday, they were given their mandate, including faculties to absolve certain sins reserved to the Holy See. Dear Brothers Priests, good evening! It is a great pleasure to meet with you before giving you the mandate to be Missionaries of Mercy. It is a sign of special importance because it characterizes the Jubilee, and enables all the local Churches to live the unfathomable mystery of the Father’s mercy. To be a Missionary of Mercy is a responsibility that is entrusted to you, because it requires that you be personally witnesses of God’s closeness and of His way of loving. Not our way, always limited and at times contradictory, but His way of loving and His way of forgiving, which is in fact mercy. I would like to offer you some brief reflections, so that the mandate you will receive can be carried out in a coherent way and as a concrete help for the many persons who will approach you. Another important aspect is to be able to see the desire for forgiveness present in the penitent’s heart. It is a desire that is the fruit of grace and of its action in the life of persons, which enables one to feel the nostalgia of God, of His love and of His house. The heart turns to God, acknowledging the evil done but with the hope of obtaining forgiveness. And this desire is reinforced when one decides in one’s heart to change one’s life and to sin no more. It is the moment in which one entrusts oneself to God’s mercy, and has full confidence of being understood, forgiven and supported by Him. Let us give great space to this desire of God and of His forgiveness; let us have it emerge as a true expression of the grace of the Spirit who spurs to the conversion of heart. And here I recommend that you understand not only the language of the word, but also that of gestures. If someone comes to you and feels something must be removed from him, but perhaps he is unable to say it, but you understand … it’s all right, he says it this way, with the gesture of coming. First condition. Second, he is repentant. If someone comes to you it is because he doesn’t want to fall into these situations, but he doesn’t dare say it, he is afraid to say it and then not be able to do it. But if he cannot do it, ad impossibila nemo tenetur. And the Lord understands these things, the language of gestures. Have open arms, to understand what is inside that heart that cannot be said or said this way … somewhat because of shame … you understand me. You must receive everyone with the language with which they can speak. There is also another passage of Genesis that strikes me and it is the story of Noah. We all know it, but we rarely remember the episode in which he was drunk. In the Bible, Noah is considered a just man yet, he is not without sin: his being drunk makes one understand how weak he was, to the point of failing in his dignity, a fact that Scripture expresses with the image of nakedness. However, two of his sons take his cloak and cover him so that he returns in the dignity of father. This passage makes me say how important our role is in confession. Before us is a “naked” person, and also a person that doesn’t know how to speak and doesn’t know what to say, with his weakness and his limitations, with the shame of being a sinner, and so many times unable to say it. Let us not forget: the sin is not before us, but a repentant sinner, the sinner who would like not to be like this, but is unable <to change>, a person who feels the desire to be heard and to be forgiven. A sinner who promises that he doesn’t want to be estranged from the house of the Father and that, with the little strength he has, wants to do all he can to live as a child of God. Therefore, we are not called to judge, with a sense of superiority, as if we were immune from sin. On the contrary, we are called to act like Shem and Japheth, Noah’s sons, who took a cover to spare their father shame. To be a confessor according to the heart of Christ means to cover the sinner with the cover of mercy, so that he is no longer ashamed and is able to regain the joy of his filial dignity, and is also able to know where it is found again. Therefore, it is not with the cudgel of judgment that we will be able to bring the lost sheep back to the sheepfold, but with the holiness of life that is the principle of renewal and of reform in the Church. Holiness is nourished by love and is able to take upon itself the weight of the one who is weaker. A Missionary of Mercy carries the sinner on his own shoulders, and consoles him with the strength of compassion. And the sinner who goes there, the person who goes there, finds a father. You have heard, I have also heard, so many people who say: “No, I don’t go anymore, because I went once and the priest beat me, he reprimanded me so much; or I went and he asked me some obscure questions, out of curiosity.” Please, this isn’t a good Pastor, this is a judge who perhaps thinks he hasn’t sinned, or is a poor sick man who is inquisitive with his questions. But I like to say to confessors: if you don’t feel you are a father, do not go to the confessional, it is better if you do something else. Because so much harm can be done, so much harm to a soul if it is not received with the heart of a father, with the heart of Mother Church. Some months ago I was speaking with a wise Cardinal of the Roman Curia about the questions that some priests ask in the confessional and he said to me: “When a person begins and I see that he wants to throw something out, and I remember I must understand, I say to him: I understand! Be tranquil!” And forward – this is a father. I support you in this missionary adventure, giving you as examples two saintly ministers of God’s forgiveness, Saint Leopold and Saint Pio – there, among the Italians, there is a Capuchin that resembles Saint Leopold very much: small, with a beard … — together with so many other priests that in their life have witnessed God’s mercy. They will help you. When you feel the weight of the sins confessed to you and the limit of your person and of your words, trust in the strength of mercy that goes to encounter all as love and that knows no limits. And say as so many holy confessors: “Lord, I forgive, put it on my account!” And go forward. May the Mother of Mercy assist and protect you in this very precious service. My blessing accompanies you and you, please, do not forget to pray for me. Thank you.